Early in our marriage (20 years ago or so), my husband and I found an enormous cookbook all about baking (in other words, it was full of cookies and cakes and breads and pies. Yum!). 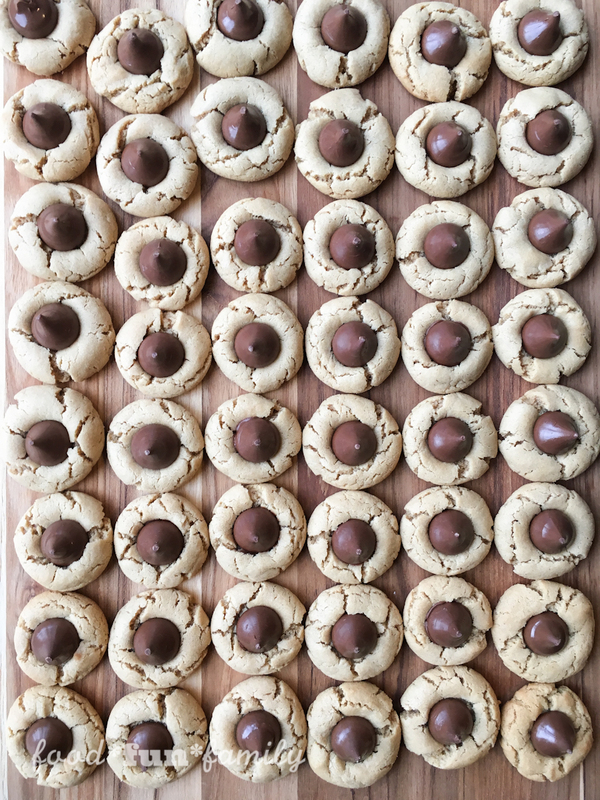 He started making Peanut Butter Blossoms (sometimes called Black-Eyed Susans or Peanut Butter Kiss Cookies) so long ago that I can’t remember a time when these weren’t his famous cookies. I guess 20+ years IS a long time to be making the same recipe. These cookies are my hubby’s signature treat, and everybody loves them. 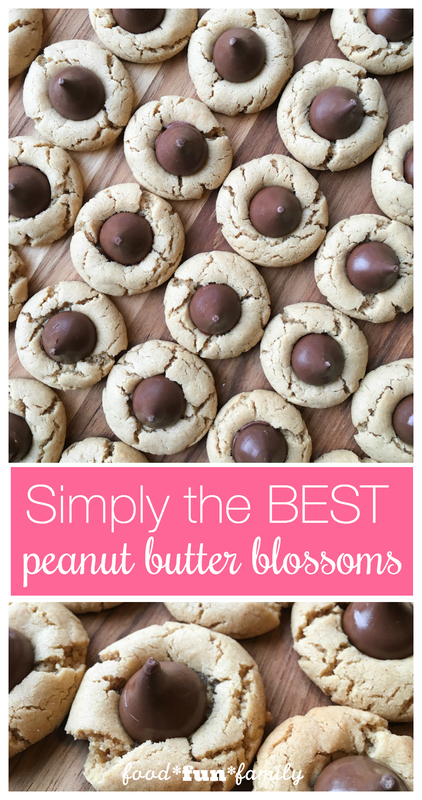 They really are the BEST peanut butter blossoms I’ve ever had! There’s something about the small cookie topped with a Hershey’s Kiss that is totally, completely addicting. I can never eat just one! Click below for the recipe PLUS 3 tips that take a basic cookie recipe to the next level. Seriously! I don’t have a hand beater could I just a regular whisk or my hands? Thank you! Definitely! I personally love using a big wooden spoon or just kneeding the dough with my hands once it gets too thick. I think it would be too heavy for a regular whisk. These are my husband’s favorite Christmas cookie, but I’ve had some problems with them in the last few years. I decided to try again with your recipe. They came out great. Thank you for posting your husband’s recipe. I’ll be printing this out so I remember for next year. I just made them…..they turned out great! This recipe is a keeper! Thank you! I use to love these as a little girl. I will have to make some to remind me of childhood memories. Thanks for sharing the recipe! I love thes cookies, but have never actually made them. So my daughter and I are going to try this one. Hopefully we’ll actually have some left to put in the oven!! This is a great recipe. I make these every Christmas. These have always been a favorite. This is my favorite childhood cookie! I love how melted the Kiss gets. I’m definitely going to try these. These cookies look so pretty and yummy! Yum! I have had these cookies before but have never made them. There is nothing better than peanut butter and chocolate. I will have to try making these. I have never made these cookies before, and they look so delicious and fun to make with my daughter. We will have to make these soon. Thanks for sharing another awesome recipe! These are very tasty cookies! Mine spread out more than yours, though I followed the recipe to a tee (I even weighed the flour). Next time I may back off on the milk a bit. Thank you for providing a link to the cookie scoop you used; it kept me from using the wrong size scoop. This is the best recipe. Who would not love peanut butter and chocolate together, right? These are one of my favorite kinds of cookie! I will definitely try your recipe :) Thanks for sharing. Wow, these DO look fame-worthy. I love this classic cookie but have never been thrilled with my recipe for them. Will try this ASAP. It just might change our lives. ;) If it does, I’ll REALLY be glad I found you @ Wonderful Wednesdays!